SPEEDWAY -- In an daring early Sunday morning attempt, Muffins McSnugglepants, the kitten accused of mauling a westside resident, has escaped from the Speedway Jail and is currently at large. "At about 6 a.m. the morning shift supervisor arrived at the jail to discover a loosened brick had been removed from the outer wall of the jail. 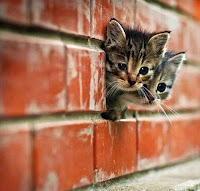 The jail cell housing Muffins and another kitten, Mittens McSpangle, was empty. They were last seen near the Indianapolis Motor Speedway at 16th and Georgetown. Because of their tiger-like claws and teeth, they are to be considered armed and dangerous." Mittens had been picked up on a public intoxication charge Friday night and was awaiting a bail hearing set for Monday morning According to a police report, Mittens had been taken by his owner to a westside Libertarian meeting held at a Speedway bar. At some point Mittens left the bar and was found wandering the westside, allegedly high on catnip. 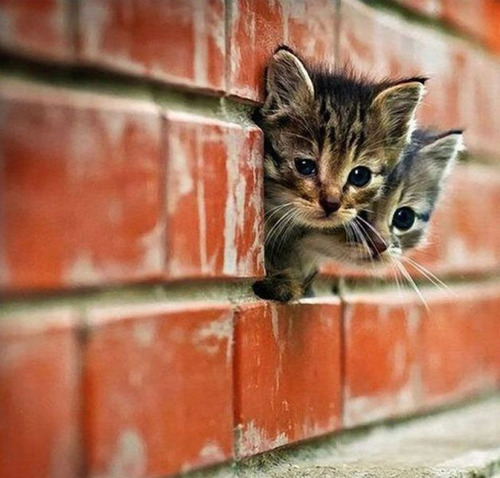 An alert local resident snapped a photograph of Muffins and Mittens escaping through the hole in the wall of the Speedway jail. If anyone sees either of these felines, they are asked to immediately contact the Speedway Police Department.